Laura Morrison has spent over two decades working her way up from the floor of the New York Stock Exchange to managing the US and European ETF listings business for Cboe, formerly Bats. 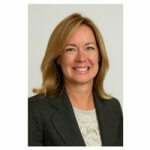 She is now senior vice president, global head of listings as well as Women in ETFs global governance board member. Having worked across several disciplines, Morrison talked to Jobs In ETFs about how she rose up the corporate ladder, the importance of mentoring and the future of the ETF market. Jobs In ETFs (JE): Can you explain briefly about how have you made progress in your career and what your roles involved? Laura: I’ve worked in the financial industry for over 20 years, primarily in the equity stock exchange business, starting my career on the floor working for a specialist unit and learning to understand all the micro market structure aspects of what it takes to trade equities. For much of my career, I worked for the NYSE in both the corporate listings business and the transaction and sales business, so those two experiences certainly qualified me to manage the ETF listings and trading business, which I started in 2007 for NYSE Arca. I’d worked there for many years, building significant market share in ETF listings and trading, but then I decided, after someone tapped me on the shoulder, to make a change in 2015 to join BATS, the alternative trading system, which has since been acquired by Cboe. Essentially, I’m rebuilding the business there, bringing a different perspective on what lists on an exchange and what an exchange can do for the client to provide the best market quality for their end investor. JE: What does your typical day look like? Laura: My typical day is client engagement, whether in person or over on phone; it’s managing through the launch opportunities of new products coming to market; it’s advocating for new asset classes to be offered within ETFs and enhancing the market structure of how products trade with much more transparency and less fragmentation. I’m responsible for our European and US platforms. JE: What motivated you to work towards this senior position? Was it money, or finding a new challenge? Laura: During an internship in college I was so fascinated by market mechanics and how trading works in the equity space. It’s always been a true interest of mine, not only from the standpoint of how stocks and ETFs trade, but from a global perspective – I’m very intrigued with different structures all over the world. JE: What have you found personally to be the most challenging aspect of your career? Laura: I have to say that cultural changes within companies can be one of the more challenging opportunities, if I can turn it around in that way. Having been involved in so many different acquisitions, either being part of a company that acquires another company or being acquired, that creates a different set of rules on how to move forward and advocate for your clients and build different systems that support it. From that standpoint it’s fascinating to me. If I think about personal challenges, there really aren’t many. Having the opportunity to live in such a large city as New York with so many opportunities and challenges that I’ve experienced, having lived and worked downtown and having gone through 9/11 and the hurricanes and superstorms that have come in – that sort of thing I’ve had to overcome, as these events were personally affecting as well as impacting the exchanges and people I’ve worked for. JE: Is having a mentor important? Laura: I have had several mentors who have helped me in such amazing ways in terms of sponsoring and advocating for me to rise through the corporation. They had a seat at a table when the discussion was happening, so they brought my name up as a candidate to take over additional responsibilities, so, to answer your question, yes, absolutely. I’m thinking of Lisa Dallmer, who is well known in the ETF space and has moved on to focus on technology, operation and implementation, and Joe Mecane who is a phenomenal mentor of mine. I think mentoring circles have to occur naturally. You can’t force a mentoring circle and hope lifelong relationships will just continue. Although I have mentored a number of people who reached out to me for career advice and we keep in touch. Based on my advocacy, Cboe is a sponsor for American Corporate Partners, a programme which aims to ease the transition from the military to the civilian workforce in the US. ACP staff personally pairs every applicant, hand-picking a mentor for each protégé based on career compatibility, experience level, location and personal interests. For every $1,000 donated by Cboe, a mentor and protégé are paired for a year commitment. As a mentor, I coach my protégé on interview techniques such as negotiating for a new position at a higher salary. I was paired with my Protégé in November of 2017 and really enjoy it as our discussions are broad covering all aspects of life. This structured approach works really well in that I expect our mentor/protégé year-long commitment to naturally continue for years. At Women in ETFs, while there have been more formal programmes developing from mentoring, the best ones happen naturally. The best ones occur where one person really sees that opportunity and the other person helps to bring them along or recommend them for a job. JE: You’ll be speaking at the 2018 ETFs Global Markets Roundtable in London this week. What will you be discussing? Laura: I am looking forward to it. It’s a chance to share the European perspective of listing ETFs and market structure, and it’s the first time that Ari Burstein and Deborah Fuhr have created this conference in the UK. I did participate last year in New York, and I liked that the event takes a different perspective – frankly, it’s right up my ally of expertise – on the ETF industry compared to the one that other conferences have taken in the past, and that different perspective dives deeper into trading, market structure and the mechanics of how an exchange works and doesn’t work and the regulatory implications along the way. JE: How has the market changed in your professional experience and what does the future look like? Laura: The market has changed tremendously in the past 20+ years. When I started, human interaction in a floor-based system was much more prevalent. Due to improvements in technology and regulation, such as the US Regulation National Market System (Reg NMS), exchanges who have survived committed wisely in technology to enhance their market model. Regarding the European landscape, there have also been a tremendous number of completed and proposed exchange acquisitions tied to system and technology builds. It’s the same: the exchanges that continue to invest in technology and do it the smartest way will survive. The others will not. JE: Do you have to proactively do a lot of reading to keep up with the market or do you find that you are simply immersed and up to date through your job? Laura: Both. I need to keep up with all the articles published by Cboe’s terrific ETF.com journalists and editors as well as so many other media outlets who cover ETFs. There is no shortage of important articles, academic papers, SEC filings, issuer viewpoints and market maker blogs published daily on new products and market movements. Keeping abreast of this is especially important during times of volatility in the marketplace such as the Flash Crash of May 2010, August 24, 2015, or more recently on February 5, 2018. These situations provide the opportunity for truly testing market mechanics of our US structure. When the markets do not perform as expected, causing a loss of investor confidence, exchanges need to consider making changes like we did with the SEC on Amendment #12 to the Limit Up – Limit Down (LULD) Plan. Laura: There’s so much opportunity, there really is. It’s such a cool industry to be a part of because of the growth and expansion. We’ve only tapped into a portion of it, there are still people who aren’t aware of what an ETF is and how it works and how it compares to other investment packages. We keep talking about building a trade group that would include all ETF industry participants and the primary purpose of the group would be to educate. I’d love to come up with a 1990-s style “Got Milk?” advertising campaign for ETFs to make sure the benefits of these tools for investment purposes are better understood. Versus more traditional developments in the finance industry, there are more opportunities for women in the ETF ecosystem than there ever have been in the past and compared to other areas like the mutual fund or investment banking industry. A lot of that has to do with the strength of the leaders in our industry, both men and women. It’s also a younger industry so we’ve been able to incorporate cool aspects; hence the growth of Women In ETFs is a perfect result of that.